Michaela Busch racing in hurdle event at meet. 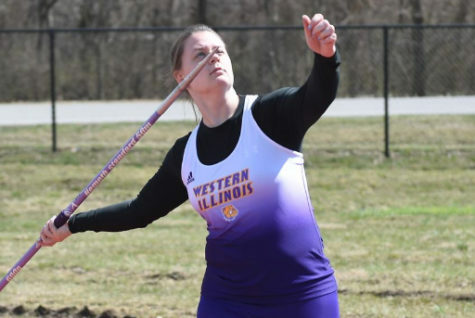 NORMAL Ill. – The Western Illinois track and field teams traveled over to compete against Illinois State University in the Redbird Invite where they finished fifth out of six teams. Many Leathernecks earned new collegiate bests, including freshman Nick Olson who continued to dominate in the field events. 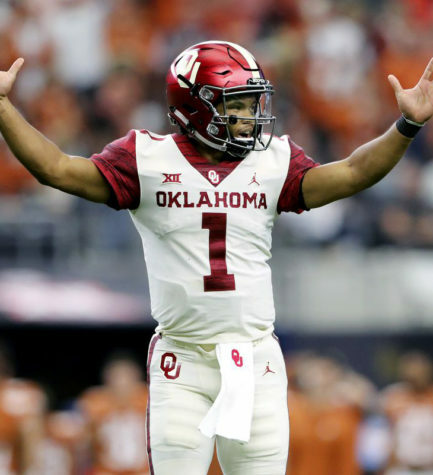 Two weeks ago, he set a new PR in javelin, and since then he has never turned back. 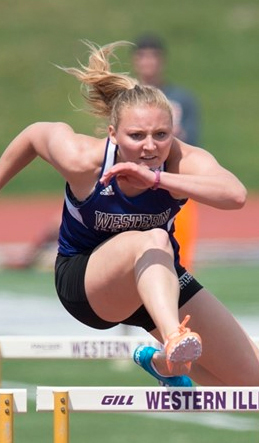 Olson took Western’s one and only first place win with a mark of 49.68 meters (163’ 0”). Such a feat made assistant coach, Nick Maas, extremely pleased. “Nick Olson continues to impress in less than ideal conditions. The javelin is beginning to become a premier event for him,” Maas siad. Seven Leathernecks ran the 200-meter race, and six of them walked away with new PR’s. Senior Raytoria Richardson had the best time at 25.25 finishing ninth. She was followed by sophomore Michaela Busch (26.43), freshman Claire Young (26.49) and fellow sophomore Rachel Hilton (27.01). For the men, sophomore Justin Montalto and junior Darius Patterson finished with times of 22.63 and 22.70 respectively, each earning PR’s in the event. Junior Jasmine Swanagan and freshman C’Andria Campbell both competed in the hammer throw. Swanagan came in at seventh recording a mark of 43.50 meters (142’ 8”) while Campbell threw 39.56 meters (129’ 9”). Richardson wasn’t done on the day as she recorded her second PR in the 100-meter dash where she logged a time of 12.53. She competed alongside freshman Amelia Peterson who was competing in the event for her first time and recorded a time of (13.08). Continuing the day’s success was sophomores Michaela Busch and Abigail Richter along with junior Khalyia Lawson each earned second in their events. Richter missed setting a new PR by mere seconds, but still picked up second clocking in a time of 11:24.38 in the 3,000-meter steeplechase. Busch matched her finish in the high jump (1.66 meters / 5’5.25″) but also achieved a new PR in the 100-meter hurdles when she ran a 15.20. Lawson along with freshman Victoria Adesola had back-to-back second and third place finishes in the long jump. Lawson had a 4.77-meter effort (15’ 7.75”) while her partner trailed closely 4.74 meters (15’ 6.75”). A couple of Leathernecks came in with fourth-place finishes to end the day as freshman Bo Brassuer picked up a PR along the way in the 400-meter dash (49.46). Sophomores Nicole Beebe ran a 10:38.84 in the 3,000-meter run while Josh Kirby recorded a time of 15.58 in the 110-meter hurdles to obtain fourth as well. They might not have placed as high as they would have liked to, but coach Maas was still pleased with side moving forward. The Leathernecks will continue their outdoor season against some tough competition in Mizzou and Drake University. They head down to Columbia, Missouri this weekend to visit the Tigers in the two-day Tom Botts Invitational. Things will kick-off at 4:30 p.m. this Friday.